Noise reduction earplugs are good for those who work in noisy environments. While some forms of hearing loss are inevitable, there are others that can be prevented. The main preventable type is noise-induced hearing loss, which comes from hearing loud noises over a long period of time. Ear plugs are a great way to protect your ears from loud noises so that you don’t have to worry about possible hearing aids or Tinnitus in the future. Here are some common types of earplugs to help determine which is best for you. They have earplugs for noise reduction in general. These are used to protect your ears from any loud environmental noises such as when using power tools, lawn equipment, explosives, or going to a concert. 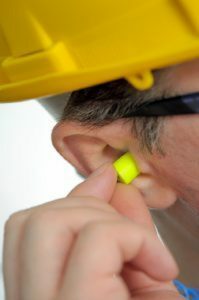 If you work in an environment such as a construction zone where a lot of loud noises are present, noise reduction earplugs are the type for you. Anytime you are around gunfire, earplugs should always be worn. Any noise above 85 decibels has the potential to cause noise-induced hearing loss and a gunshot can reach up to 140 decibels or more, which can cause immediate, permanent damage. These earplugs should be worn by military personnel that are exposed to gunfire, anyone working or attending a gun range, and those who hunt or shoot recreationally. They offer these in an electronic type that will still allow you to hear conversations and small noises, but protects from the loud noise. When you go to a concert, you will likely see earplugs in the performer’s ear. This is because instruments and music can reach damaging levels by themselves and are often combined with amplifiers and sound systems on stage. High fidelity earplugs are specially made for musicians because they still need to hear what they are doing. They are designed to let in the sound needed to hear the music and protect from the damaging noises. These earplugs factor in the frequency of the person’s ear in order to effectively let in the best quality of musical sound. Contact Bay Area Audiology Today For Your Custom Earplugs! Ready to change the way you look at hearing loss? Our Doctor of Audiology, Dr. Trisha A. Bents Muth, is exceptionally experienced in the art of audiology, and is dedicated to providing the absolute best solutions. Bay Area Audiologyhas been working to give patients a comfortable environment, with thorough evaluations. We are independently owned, and unbiased when it comes to finding you the care you need. This entry was posted on Thursday, March 29th, 2018 at 3:02 pm. Both comments and pings are currently closed.